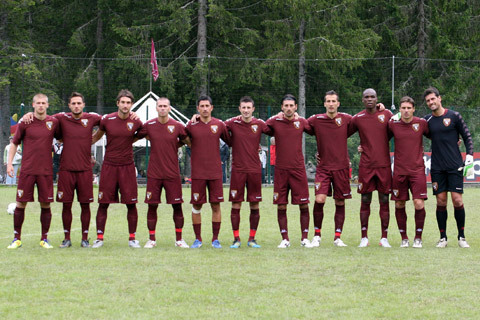 Torino have completed their two week ritiro in the picturesque village of Sappada, and remained unbeaten throughout their four friendly matches. Torino began their warm up for the new season with a fixture against their hosts for the fortnight, A.S.D Sappada, and began in convincing style. Whilst too much should not be read into Torino's 12-0 victory, due to the weakness of their opposition, but Mirco Antenucci and Nnamdi Oduamadi looked impressive as both scored hat tricks. Spare a thought for Torino's third choice goalkeeper Lys Gomis who kept goal for Sappada in an attempt to keep the match relatively competitive. By all accounts, despite conceding 12 times, he did a good job for Torino's opponents, and made numerous saves to keep the score down. Sappada: Gomis, Hoffer, Massa, M.Piller, A.Fontana, Albore, Puicher, G.Fontana, De Zordo, Puntil, Piller, Roner. All. : Danieli. Torino: Coppola (al 46' Morello), D'Ambrosio (al 46' Darmian), Di Cesare (al 46' Glik), Ogbonna (al 46' Pratali), Zavagno (al 46' Rubin), Vives (al 46' Basha), Iori (al 46' Zanetti), Stevanovic (al 40' Oduamadi, al 77' Chiosa), Bianchi (al 46' Verdi), Antenucci (al 46' Suciu), Sgrigna (al 46' Guberti). A disposizione: . All. : Ventura. Torino's second fixture was much more competitive as they faced Feltrese from the Eccellenza (Sixth Division) but again recorded a comfortable 3-0 victory, with Mirco Antenucci and Nnamdi Oduamadi continuing their fine form by again getting on the scoresheet, along with Simone Verdi. Feltrese Prealpi: Sgrò, Marin, Giazzon, Ferrara, Fin, Moretti, Da Riz, Strapazzon, Crestan, Argenta, Bressan. All. : Marchetti. Torino: Coppola (al 46' Morello), Darmian (al 46' D'Ambrosio), Glik (al 70' Chiosa), Ogbonna (al 46' Pratali), Rubin (al 46' Zavagno), Vives (al 46' Oduamadi), Iori (al 46' Suciu), Verdi (al 46' Basha), Ebagua (al 70' Zanetti), Bianchi (al 46' Antenucci), Guberti (al 46' Sgrigna). A disposizione: - All. : Ventura. Marcatori: Verdi 34', Antenucci 76', Oduamadi 85'. 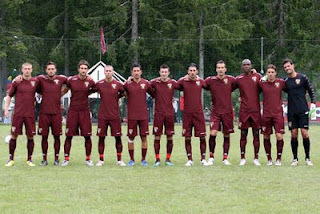 In their third fixture of the Ritiro, Torino faced a step up in quality, as they took on Taranto from the Lega Pro. Torino were made to fight hard in this match, but did eventually come out on top with a 2-1 victory. Rolando Bianchi, whose future at the club is still uncertain, opening the scoring with his first goal of the pre season campaign. Taranto equalised in the second half, but just seven minutes later, Torino regained the lead via Giulio Ebagua. Taranto: Bremec (al 46' Barasso), Sosa (al 46' Cutrupi), Di Bari (al 46' Giordano), Prosperi (al 46' Colombini), Antonazzo (al 46' Garufo), Di Deo (al 46' Giorgino), Vicedomini (al 46' Rizzi), Sabatino (al 46' Sciaudone), Russo (al 46' Rantier), Guazzo (al 46' Girardi), Chiaretti (al 46' Karvonen). All. : Dionigi. Torino: Coppola (al 46' Gomis), D'Ambrosio (al 46' Darmian), Di Cesare (al 46' Glik), Ogbonna (al 46' Pratali), Zavagno (al 46' Rubin), Stevanovic (al 46' Oduamadi), Iori (al 46' Suciu), Vives, Guberti (al 46' Verdi), Bianchi (al 46' Sgrigna), Antenucci (al 46' Ebagua). All. : Ventura. Torino's final game in the Dolomites was their toughest test as they played Serie A side Fiorentina, in a match that was broadcast live on Italian television. The first half was a disappointing spectacle (even by pre season standards) and the match was only livened up when a tackle by Guiseppe Vives almost sparked a not so 'friendly' brawl between the two sides. Torino improved in the second half, with substitute Nnamdi Oduamadi looking particularly impressive on the Left Wing, but the match ended 0-0. Fiorentina: Boric (al 46' Neto), De Silvestri (al 46' Romulo), Natali (al 65' Nastasic), Gamberini, Pasqual (all'80' Piccini), Behrami (al 65' Salifu), Montolivo (all'80' Agyei), Munari (al 46' Lazzari), Cerci (al 65' Marchionni), Gilardino (al 46' Babacar), Jovetic (al 65' Ljajic). All. : Mihajlovic. To celebrate Giulio Ebagua goal in Tuesday's friendly against Taranto, (his first since re-signing with Torino), I made this video, that consists of all the goals he scored last season at Varese. It is only the middle of July but Torino have already made ten signings this summer, with Roma winger Stefano Guberti becoming the latest to join the club. Because of Giampiero Ventura's chosen formation (a 4-4-2, that can become a 4-2-4) attacking wingers are vital in order for this system to be effective, and the coach had earmarked Guberti as a potential signing, and has now got his wish. Guberti spent last season on loan at Sampdoria, and scored five goals but was unable to help them avoid relegation from the top division. However, for a player who did impress on occasion in Serie A, Guberti should be able to excel in a lower division and in a team that will suit his style of play. Whilst Guberti has signed for Torino on an initial loan deal, Toro will have the option to sign him on a co-ownership deal at the end of the season. Although it is always dangerous to judge the quality of a player on the basis of a Youtube compilation, this video will allow you to see him in action. Torino have made their fourth signing of the week by sealing a move for Lecce midfielder Giuseppe Vives, who becomes the first player to be signed outright in this transfer window. All of Torino's previous eight signings of the summer (Ebagua, Verdi, Coppola, Oduamadi, Iori, Darmian, Glik, Basha) had been signed on either a loan or co-ownership basis, so the purchase of Vives may herald a change in transfer strategy by Sporting Director Gianluca Petrachi. 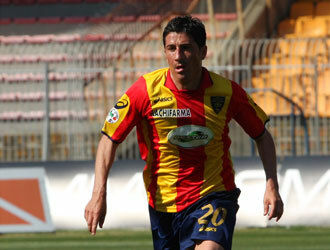 Vives has been a regular in the Lecce midfield for the past five seasons and was named the best midfielder in Serie B when Lecce gained promotion in the 2009/10 season. Torino's busy week in the transfer market continued as today they confirmed the signing of Atalanta midfieder Migjen Basha on loan. Basha (24), who was born in Switzerland but is of Albanian descent, found playing time limited at Atalanta last season, and whilst he did appear twenty three times for the Bergamo club, the majority of those appearances came as a substitute. The purchase of Basha adds some much needed depth to the centre midfield area for Torino, and Toro will be hoping that he will be able to recapture the form he enjoyed in the 2009-10 season at Frosinone that persuaded Atalanta to purchase him in the first place. Should Basha impress during his loan spell, Torino will be able to exercise an option in the loan contract to sign him on a Co-Ownership deal. Torino have added another new face to the squad for the upcoming season by completing the signing of Palermo defender Matteo Darmian on loan. Darmian (21), who began his career at AC Milan (and they still own part of his contract) is a right back, and featured in eleven matches for Palermo last season. As Torino only have one other right back on their books, the arrival of Darmian is vital, and he will compete with Danilo D'Ambrosio for a starting position. In his entire professional career, Darmian has only scored one goal, that he scored whilst on loan with Padova in the 2009/10 season. Despite the commentators claim that it is a 'gol fantastico', I think it is safe to say, that the goal was a fluke. Torino have made yet another summer signing, with Palermo's Polish central defender Kamil Glik joining the club on a co-ownership deal. At 6'3, Glik will certainly add some height to the Torino defence, but his arrival could cast further speculation on the future of Angelo Ogbonna, who has been linked with a move to almost every club in Italy. Glik spent last season on loan with Giampiero Ventura's former team Bari, and despite only signing in January, he made sixteen appearances for the club, but was unable to help them avoid relegation to Serie B.
Whilst Torino have been active in the transfer market this summer, the fact that of the signings they have made, none have been signed outright, as all six acquisitions have arrived on either co-ownership or loan deals. Although this strategy does have its short term advantages (the biggest one being that it is cheaper than buying players outright) it must also be considered to be a risky strategy. If the players who are on loan (Iori, Coppola, Oduamadi) impress sufficiently, then their parent clubs may decide that they know want to keep them, or demand a large fee to make the move permanent. Similarly, should those who have signed on co-ownership deals impress (Ebagua, Verdi, Glik) then the fee to buy the other 'half' of the player will only increase. Although this strategy is understandable, it would be good to see Torino take a risk and sign at least one player permanently this summer, if only to show some faith in the ability of the players that they are signing. However, should the players that have already signed help Torino gain promotion to Serie A, then I certainly will not be complaining about whether they are loans, co-ownerships or outright signings. With less than one week until Torino depart for their pre season training camp in the Dolomites, Toro have made Chievo midfielder Manuel Iori their 5th summer signing. After the departure of a number of central midfield players, coach Giampiero Ventura has made strengthening this area of the team a priority, and with continued links to Atalanta's Migjen Basha, Iori may not be the only central midfielder who signs for Torino this summer. Whilst Iori's parent club is Chievo, the twenty-nine year old spent last season on loan at Livorno, scoring three times in 39 matches. As that statistic shows, Iori could not be described as a prolific goalscorer, and is apparently more of a regista, a deep lying playmaker who dictates the play for his teammates. Iori has joined Torino on an loan, with an option to sign him on a Co-Ownership deal should he impress. Whilst Torino's sporting director Gianluca Petrachi has often spoken this summer about having the bulk Torino's signings completed before they depart for their pre season training camp in Sappada on the 15th July, it was still somewhat surprising when late on Thursday night, Torino announced the purchases of three new players - all from AC Milan. With Torino only having one experienced goalkeeper on their books (Davide Morello) the purchase of a new goalkeeper was one of their primary objectives in this transfer window. That search now looks to be over with the signing of Ferdinando Coppola who has joined on a season long loan deal from the current Serie A champions. Despite technically being an AC Milan player, Coppola has never actually played a competitive fixture for his parent club, with the Rossoneri preferring to loan the player out. Last season, Coppola was on loan at Siena as he helped them achieve promotion to Serie A, and Torino fans will be hoping that he can repeat that success with the Granata. Torino's business with AC Milan did not end their however, as they also negotiated the purchases of two of Milan's younger prospects. Nigerian winger Nnamdi Oduamadi has also signed on loan, who despite only making one first team appearance for his parent club, has performed well for Milan's Primavera team, and at only twenty years of age has plenty of room for improvement. Perhaps the most surprising of the three purchases would be the signing of 18 year old Simone Verdi on a co-ownership deal. Like Oduamadi, Verdi has been one of the standout players for Milan Primavera team and has also made appearances for the first team. At only 5ft 7 inches tall, aerial ability is certainly not one of Verdi's strengths, but according to this article on the Football Italia website his main attributes are his pace, technique and his work rate. Whilst he can play as a trequartista, one would expect that, when selected, Verdi will play as a winger in Giampiero Ventura's 4-4-2 system. As part of the deal that has brought Simone Verdi to Torino, young Toro striker Gianmario Comi has gone to AC Milan, also on a co-ownership deal. Whilst Comi has been a regular scorer for the Primavera team, he has yet to breakthrough to the first team. With just over two weeks until Torino depart for their pre season training camp in Sappada, Torino fans can expect many more signings, as coach Giampiero Ventura and Sporting Director Gianluca Petrachi attempt to create a squad that is capable of gaining promotion to Serie A. However, with the future of Angelo Ogbonna continuing to be in doubt, amidst rumours linking him with moves to Juventus, Roma, Arsenal, Manchester City and Milan, some Toro fans may just be happy if he is still a Torino player by the time they play their first pre season fixture.